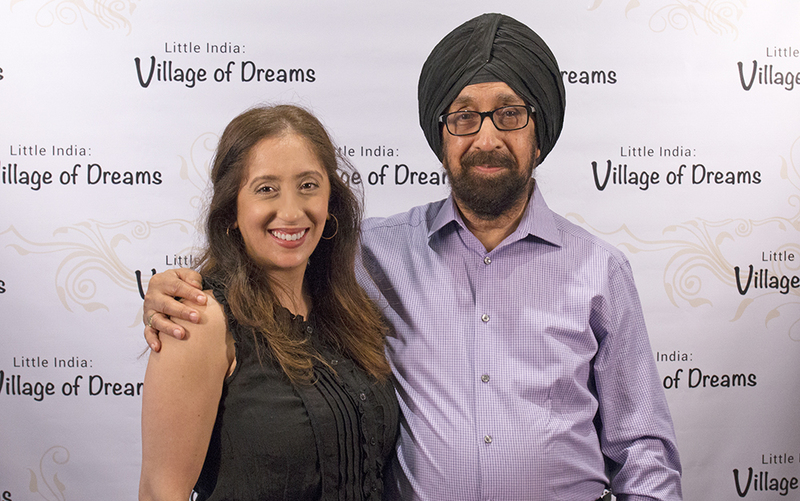 Photo © Tarun Mittal for Village of Dreams Productions Inc. The Khorana family own and operate Kala Kendar. They are: Kanweljit Khorana (aka “K S Khorana”) and his wife Chand Khorana, who opened and ran the business together though Chand is now retired; their son Gurdip (aka “Mickey”) and daughter Harleen. The Khorana family used to live over their store but since they moved their home to Markham, Mickey has established an Indian musical instrument store on the second floor. Much of his business is found through internet sales. Harleen now runs the clothing and textile business downstairs with father K S Khorana, who is often present and lends support but lets Harleen run the show. K S Khorana first opened his business which specialized in imported Japanese textiles and sarees, in Bloor West Village in 1972. In 1976 when the Naaz Theatre opened on Gerrard Street East, he saw the business potential and relocated to be close by to the new Bollywood cinema. Kala Kendar was the first Indian clothing store to open its doors in Little India. K S Khorana was one of the founders of GIBBIA (Gerrard India Business Improvement Area). Working with the City of Toronto and the Toronto Police Dept. he helped to develop strategies to smooth the way for the sudden influx of South Asian merchants who moved into the caucasian working class neighbourhood. Key challenges included creating more areas for parking, garbage collection and coping with racism.